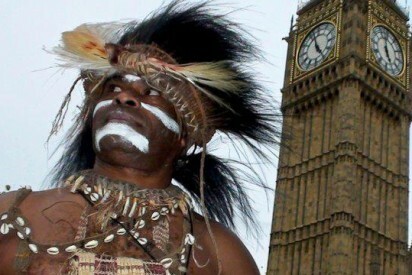 An historic step on the road to freedom for West Papua was made in London today. 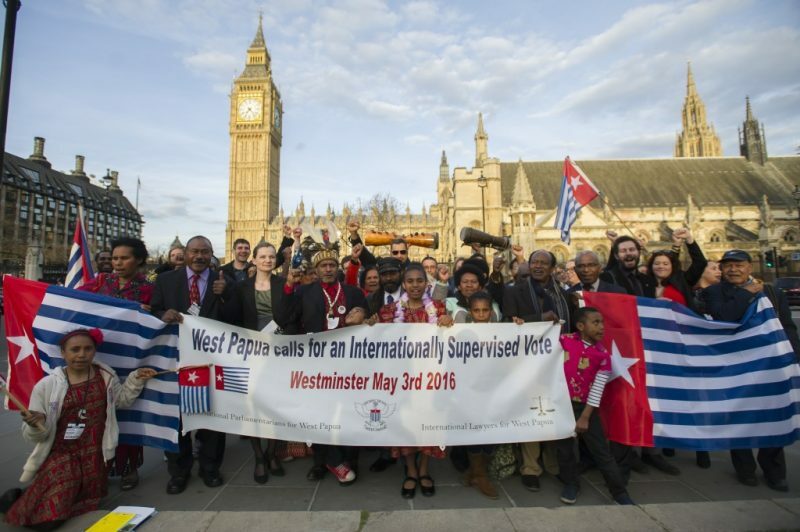 At a meeting of the International Parliamentarians for West Papua in the Houses of Parliament, a new declaration was signed calling for an internationally supervised vote on the independence of West Papua. Delegates came from around the world to attend this historic meeting on West Papua’s future. The meeting was briefed by parliamentarians, lawyers and academics, all of whom discussed and affirmed the West Papuan people’s fundamental right to self-determination. This first half of the meeting was chaired by Jennifer Robinson, the Co-Founder of International Lawyers for West Papua and opened with a thorough briefing by international academics on the history of West Papua as well as the political and human rights situation. Firstly, Mr. Norman Voss of the International Coalition for Papua (ICP) gave a damning report on the evidence of genocide and the deteriorating human rights situation in West Papua. He described in vivid detail how the numbers of West Papuans being arrested has continued to increase year after year with up to 881 people arrested last year. However, this figure was dwarfed by the 1735 people reportedly arrested on 2nd May, simply for demonstrating in support of the meeting itself. Barrister Charles Foster then outlined clearly how the Indonesian government is guilty of committing genocide in West Papua. In graphic detail he read out some of the most heinous human rights atrocities committed against the people of West Papua and stated how the situation in West Papua met all of the criteria for genocide being systematically perpetrated. Next, the meeting was briefed by Professor Keith Hyams, Director of the Politics of Papua Project, University of Warwick which conducts research and provides informed political analysis to policymakers, in order to facilitate a peaceful resolution to the conflict in West Papua. During the meeting, Professor Keith Hyams launched the latest assessment report of the University of Warwick – Assessment Report on the Conflict in the West Papua Region of Indonesia: An Overview of the Issues and Recommendations for the UK and the International Community. This report provided insightful and comprehensive coverage of the situation in West Papua and also made a list of recommendations to the British government towards helping there to be a peaceful resolution to the ongoing conflict. The report received considerable endorsement from several of the delegates present. The meeting was then briefed by members of International Lawyers for West Papua (ILWP), a network of legal professionals who recognise that the indigenous peoples of West Papua have a fundamental right to self-determination under international law. Fadjar Schouten-Korwa of International Lawyers for West Papua – Netherlands, outlined West Papua’s legal right to self-determination, covering the fraudulent 1969 so called Act of Free Choice, along with the continued legitimacy of the West Papuan people exercising their fundamental right to self-determination. ILWP Co-Founder Melinda Janki then covered legal aspects of proposals for an Internationally Supervised Vote in West Papua. She made it clear that the West Papuan people’s struggle for self-determination and Independence should in no way be considered as separatism or succession from Indonesia, but instead the restoration of the inherent sovereignty of the West Papuan people from their colonial ruler. Chaired by Co-Founder of the International Parliamentarians for West Papua (IPWP), the Rt Hon. Andrew Smith MP, this half of the meeting was opened by the Hon. Prime Minister Samuela ‘Akilisi Pohiva of Kingdom of Tonga. Speaking on behalf of his country, Prime Minister Pohiva affirmed Tonga’s full support for the ongoing struggle of the people of West Papua. He explained that responsibility for ensuring human rights are upheld in West Papua lies with the UN and that the Tongan Government will continue to push for this. He assured the people of West Papua of Tonga’s commitment to supporting a peaceful resolution to the conflict in West Papua, one which allows the people of West Papua to exercise their fundamental right to self-determination. The next speaker was the Rt. Hon Jeremy Corbyn MP Leader of Her Majesty’s Official UK Opposition. 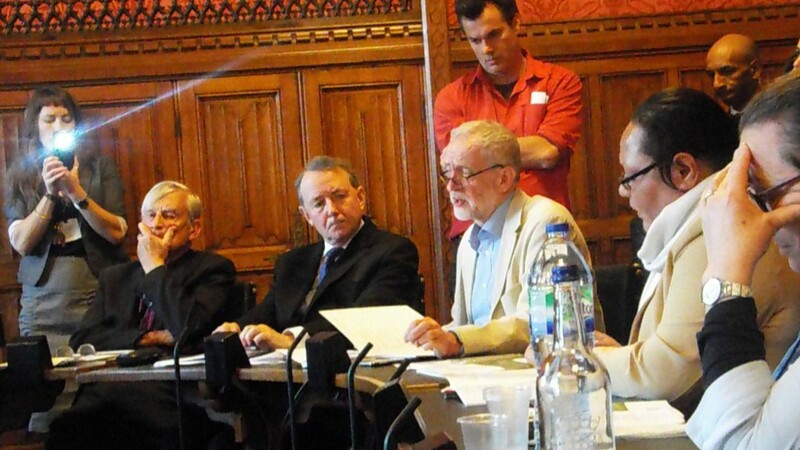 A founding member of the International Parliamentarians for West Papua, Jeremy Corbyn spoke of the need for justice and human rights to be delivered to the people of West Papua. He stated that the world could either continue having this conflict or could choose to live in a world of peace and justice which would come from the recognition of human rights for everybody – a cornerstone of foreign policy. He reiterated his support for the West Papuan people’s struggle and spoke of how he would like this to be written into the policy of the British Labour Party. Speaking on behalf of the Prime Minister and the government of Vanuatu, The Hon. Ralph Regenvanu (Minister of Lands & Natural Resources) then spoke of Vanuatu’s long term strong support for West Papua’s Independence and freedom through self-determination. He spoke of how the first Prime Minister of Vanuatu, Walter Lini had stated that ‘Vanuatu would not be truly independent while any other Melanesian country is not’. Hon. 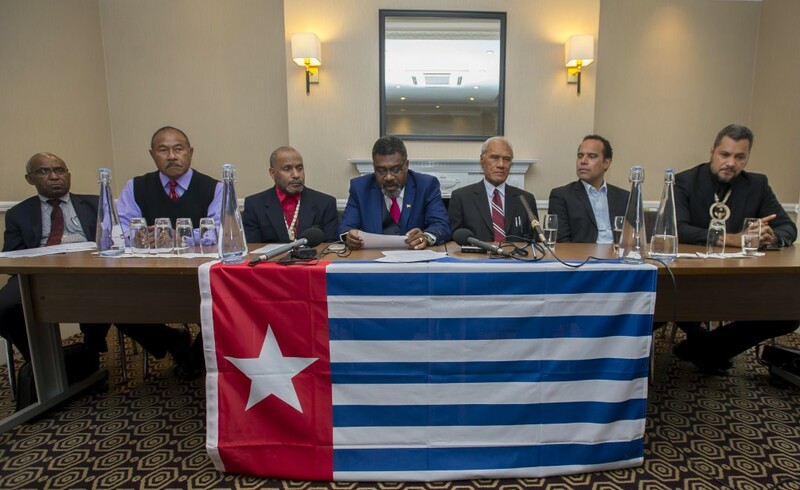 Ralph Regenvanu then reaffirmed the commitment of Melanesian countries to bring West Papua into the Melanesian Spearhead Group (MSG) and stated that Vanuatu is working for West Papua to gain full membership of the MSG at its upcoming meeting. Next, on behalf of Prime Minister Manasseh Sogavare of the Solomon Islands and his government, West Papua Envoy, Rex Horoi outlined their strategy and key areas of Solomon Islands’ support for West Papua. This involved: urgency of stopping Human rights abuse in West Papua, recognising the political identity of the ULMWP and the strategic engagement of the Solomon Islands Government with neighbours in the Pacific and around the world. Rex Horoi assured his fellow delegates of the firm commitment of the Solomon Islands to support the West Papuan people exercising their fundamental right to self-determination. He also redefined the importance of the Pacific by renaming the ‘small island states’ as the ‘big ocean states’. The next speaker was the Hon. Gary Juffa, Governor of the Northern Province, Papua New Guinea. Recallinggross violations of human rights in West Papua, Hon. Gary Juffa gave a moving speech of how his father had captained the first boat of refugees from West Papua and how he promised them that he would do everything he could to fight with them for their freedom. He explained how there is a huge, growing solidarity movement in PNG in support of West Papuan freedom and that he will continue to be one of the main political voices of this movement. Chairperson of the International Parliamentarians for West Papua and former Bishop of Oxford, Lord Harries of Pentregarth then gave a speech remembering how he first met Benny Wenda when he first came to the UK in 2003, how the issue was almost unknown at this time and what a long way it had come today with representatives from the ‘big ocean nations’ championing the cause. Finally, West Papuan Independence Leader Benny Wenda addressed the meeting and described his emotional feelings around being in the British parliament with such a high level of strong support for his people’s freedom. He showed his true gratitude and thanks to all those present and urged everyone to continue their strong support and help his people to be free before another 500,000 people are killed. 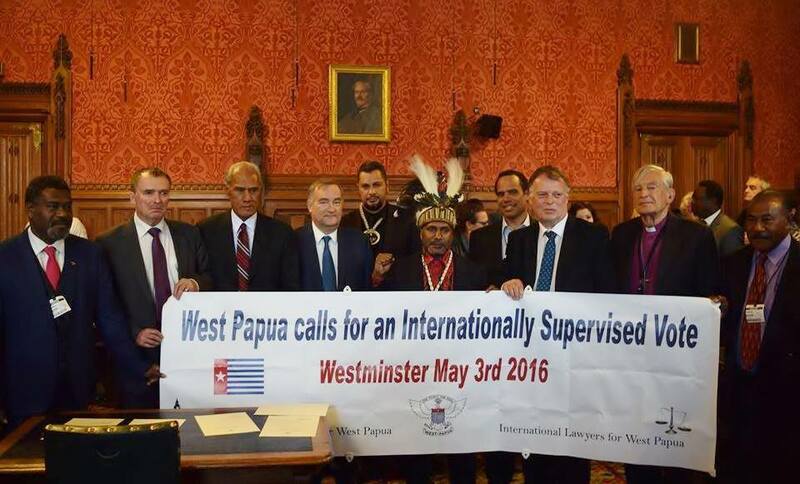 Stating that the Indonesian occupation is illegal and must be ended now, Benny Wenda finished by announcing the Westminster Declaration for an Internationally Supervised Vote in West Papua. This Internationally Supervised Vote on self-determination is to be held to ensure a peaceful future and conflict resolution for West Papua. It was signed by all international parliamentarians present. The Secretary General of The United Liberation Movement for West Papua, Octovianus Mote then concluded the meeting by thanking everyone including the various generations of West Papuans represented. He stated how this was a truly momentous day in West Papua’s history and how the growing international support for West Papua is at an all time high. This support is being accelerated by the fast growing #LetWestPapuaVote sub-campaign to raise worldwide awareness and solidarity for an Internationally Supervised Vote in West Papua. We the undersigned Members of Parliament, being members of the International Parliamentarians for West Papua: I. Declare that continued human rights violations in West Papua are unacceptable. II. Warn that without international action the West Papuan people risk extinction. III. Reiterate the right of the people of West Papua to genuine self-determination. IV. Declare the 1969 ‘Act of Free Choice’ to be a gross violation of this principle. V. Call for an internationally supervised vote on self- determination in accordance with UN General Assembly Resolutions 1514 and 1541 (XV).